Wow, I am all over the place with my creativity lately! I have a few projects in progress, but couldn't help starting a new one today. I figure I should move with the inspiration on these chilly winter days when it's sometimes hard to get off my cozy couch. Whatever wants to get made gets made. Today I am inspired by music- long lost music that once upon a time won my heart. Music has always fullfilled a deep need for me, but for a while now in my quiet state, I've forgotten about these soul lifters. (I guess I've been in my head- excessively.) So I've started the process of digging through my old albums, pulling together the favorites of the favorites. It's like hearing some of them for the first time, getting the same goosebumps. Alas, I wish I could say I created this music. I have little to no talent in that area, but I can compile one sweet playlist! There are too many gems to choose from, so this will probably be Volume I of several. This is the perfect mix for closing the door to your art space and doing a little slow dancing with your muse. 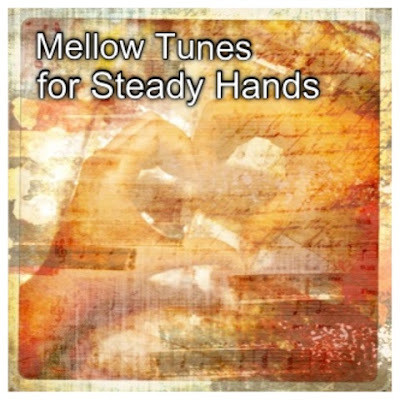 Mellow Tunes for Steady Hands is a gift for my brilliant jewelry designer friend, who is spending more time in her creative space these days. I wanted to share some of the songs that put me in my happiest creating zone the last few years. Oh how I've missed them! Singer/songwriter, indie, blues and folk flavored, some songs mellow all the way through, some with just the right amount of build up and bounce. Some old, some new, none mainstream that I know of. I am in lyric love with all of them. This is poetry set to music. It keeps my stormy thoughts at bay and helps to tune out the inner critic. It frees me up to think less and play more in my creative space. If any of this sounds appealing, I highly, highly recommend these songs. Hopefully some of them are new finds for you. No links for now, just a list, but you could easily search them and hear previews. I think that's part of the fun of discovering new music. Enjoy!